Dizzy Dean was a weakened pitcher who was feuding with his manager, but when the Cardinals traded him to the Cubs on the eve of a season opener it was a surprise to nearly everyone. On April 16, 1938, Dean was dealt to the Cubs for $185,000 and three players, pitchers Curt Davis and Clyde Shoun and outfielder Tuck Stainback. Dean, 28, had a 134-75 record in seven Cardinals seasons, including 30-7 in 1934 when he carried them to a World Series title. 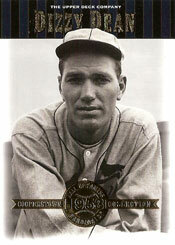 Dean won twice in the 1934 World Series against the Tigers, including a six-hit shutout in the decisive Game 7. _ Damaged arm. During the 1937 All-Star Game, a ball hit by Earl Averill of the Indians struck Dean on the left foot and broke his toe. Dean pitched again too soon after the injury. Compensating for the damaged toe, he altered his pitching motion and weakened his right arm, essentially losing his devastating fastball. _ Feuds with Frisch. Dean and Cardinals manager Frankie Frisch feuded often. After they had a couple of run-ins during spring training in 1938, the Cardinals decided to act. _ Bigger than team. Rickey and Breadon decided Dean was taking too much credit for team successes and focusing too much attention on self. “Even when he’s good, one pitcher doesn’t make a club,” Rickey said. When the Cubs first approached the Cardinals about Dean, they offered two players and $150,000, The Sporting News reported. The Cardinals countered with a demand of two players and $200,000. A compromise was reached when the Cubs added Stainback to the deal, giving the Cardinals three players, plus $185,000. The deal was completed in a phone call between Rickey and Cubs owner P.K. Wrigley while the Cardinals were defeating the Browns, 10-7, in an exhibition game at St. Louis on April 16. The trade was announced immediately after the game, stunning Cardinals players. “There goes our pennant and World Series money,” Pepper Martin said. Also, Rickey had a personal incentive to trade top players for cash because his contract called for him to get a percentage of the sale as remuneration in addition to his salary. Though sidelined for most of May, June and July, Dean was effective when he pitched in 1938. He was 7-1 with a 1.81 ERA in 13 games for the 1938 Cubs, who won the National League pennant. The Cardinals stumbled to a sixth-place finish and Frisch was fired in September before the season ended. Dean, however, never regained the form that made him a sensation with St. Louis. He was 9-7 over the next three seasons with Chicago.